This article is about the men's team. For the women's team, see Qatar women's national football team. The Qatar national football team (Arabic: منتخب قطر لكرة القدم‎) is the national team of Qatar and is overseen by the Qatar Football Association. The team has appeared in ten Asian Cup tournaments and won it once in 2019. They play their home games at Khalifa International Stadium and Jassim Bin Hamad Stadium. The latter is considered the home stadium for the team. Qatar will host the 2022 FIFA World Cup and therefore qualify automatically for what will be their first appearance in the finals. This will be the first time the host nation has never previously competed at the World Cup since the second World Cup in 1934 and the first time that an Arab nation will host the competition. Football was brought to Qatar during a time which coincided with initial discovery of oil reserves in Dukhan in 1940. By 1948, expatriate oil workers played the first official football match in Qatar. The Qatar Football Association was formed in 1960, and the QFA joined FIFA in 1970. Simultaneously during this period, the Bahrain Football Association were drawing up plans for the establishment of a regional football competition within the GCC and Qatari officials were involved with the corroboration of this proposal. The plans came to fruition and in March 1970 the Arabian Gulf Cup was inaugurated. The Qatar national team played its first official match on 27 March 1970 against hosts Bahrain, losing 1–2 as Mubarak Faraj scored the sole goal for Qatar. The newly formed Qatar national team posted underwhelming results in the first Gulf Cup tournament, coming in last place with a single point, with the highlight of their tournament being a 1–1 draw with the Saudis in their final match. In the next edition of the Gulf Cup in 1972, Qatar was again relegated to last place after suffering 3 straight defeats. The next tournament in 1974 proved to be somewhat of a break-through for the Qataris as they achieved their first triumph in international football with a 4–0 victory over Oman. The Qataris lost out to Saudi Arabia in the semi-finals, but achieved a 3rd place standing after emerging the victors of a penalty shoot-out against the United Arab Emirates. The first time they entered the qualifying stages for the AFC Asian Cup was in 1975. They were not successful in qualifying for the 1976 Asian Cup, with Iraq and Saudi Arabia booking the group's two qualifying berths. Despite this setback, Qatar finished in 3rd place in the 1976 Gulf Cup as the host nation the next year. The national team played its first FIFA World Cup qualifying match in 1977. Qatar was set to play the United Arab Emirates on 11 March 1977, but the last minute withdrawal of the Emirati team from the competition merely postponed Qatar's debut until two days later when Bahrain were defeated 2–0 in Doha. Their Asian Cup debut came in 1980 under head coach Evaristo de Macedo. They had qualified for the tournament after topping a relatively easy group composing of Bangladesh and Afghanistan. Their showing in the main tournament was unimpressive, making an early exit from the group stages with two defeats, one draw and one win. Qatar narrowly lost to Iraq in the finals of the 1984 Gulf Cup, nonetheless they were named runners-up, their most impressive accolade until 1992. They failed to make it out of the preliminary stages of the 1982 and 1986 World Cup qualifying rounds. However, the team qualified for both the 1984 and 1988 editions of the Asian Cup. They fell short of qualifying for the semi-finals of the 1984 tournament, with Saudi Arabia's Mohaisen Al-Jam'an's 88th-minute goal against Kuwait ensuring a semi-final position for both teams. They also missed out on a semi-final place in 1988; however, they notably defeated Japan by a score of 3–0. Qatar arguably reached its peak in the 1990s, attaining its highest-ever FIFA rating (53) in August 1993. Qatar started off with an emphatic qualifying campaign for the 1990 World Cup, finishing at the top of their group. They were denied a spot in the World Cup after finishing below the United Arab Emirates and South Korea in the final round of the qualifiers. In 1990, the national team once again finished runners-up in the Gulf Cup as Kuwait won the final two matches of the tournament. Two years later, they won the competition on home soil for the first time under the leadership of Sebastião Lapola, despite a 1–0 loss against Saudi Arabia in their final game. They were also named runners-up in the 1996 Gulf Cup. Qatar reached the Asian Zone's final qualifying round for France 1998. After wins against China and Iran, they played their last match against Saudi Arabia, where a victory would have earned qualification. However, they lost out as Saudi Arabia won 1–0 to reach the finals. As 1998 Arab Nations Cup hosts, they finished runners-up to Saudi Arabia. Sebastián Soria is the top scorer and most capped player in Qatar. They made it to the quarter-finals of the 2000 Asian Cup despite finishing 3rd in their group, but lost to China in their quarter-final confrontation. They reached the final qualifying round again in 2001, but were defeated by Bora Milutinovic's China team, who topped the section to progress to their first FIFA World Cup. Frenchman Philippe Troussier took the manager's job after the 2002 World Cup in Korea and Japan, but was unsuccessful in both the 2004 Asian Cup and the qualifying campaign for the 2006 World Cup in Germany. Troussier was sacked after the World Cup qualifying campaign, and under Bosnian Džemaludin Mušović, the team won the Gulf Cup in 2004 and the Asian Games gold in 2006. Mušović stepped down after Qatar only earned two points from three matches in the 2007 Asian Cup. The job of coaching the team in qualifying for the 2010 World Cup fell to Jorge Fossati, who led the team throughout the first and second AFC rounds up to the third round. After leaving them at the top of their group with only two played matches, Fossati had to undergo stomach surgery. Subsequently, the Qatar Football Association ended their co-operation with him in September 2008, as the QFA claimed he needed too long to recover from surgery. Bruno Metsu was called up for the job, but Qatar failed to qualify after finishing fourth in their qualifying group. Qatar national team in 2011 during the 2014 FIFA World Cup qualifying rounds. Qatar was announced as hosts of the 2022 FIFA World Cup in December 2010. In 2011, as hosts of the 2011 Asian Cup, they advanced to the quarter-finals. They succumbed to a late 2–3 defeat to eventual champions Japan after a goal was scored by Masahiko Inoha in the 89th minute. Also as hosts, they went on to win the 2014 WAFF Championship after defeating Jordan 2–0 in the final. The competition was made up primarily of youth and reserve teams, of which Qatar's was the latter. Djamel Belmadi, the head coach of the B team, replaced Fahad Thani as the head coach of the senior team as a result of the team's positive performances. 10 months later, Djamel Belmadi led Qatar to gold in the 2014 Gulf Cup. They advanced from the group stages after three draws, going on to defeat Oman 3–1 in the semi-final, and were victorious in the final against Saudi Arabia, who were playing in front of a home crowd, by a margin of 2–1. Despite winning the Gulf Cup and finishing the year 2014 with only one defeat, Qatar showed a poor form in the 2015 Asian Cup. Qatar was defeated 1–4 by the United Arab Emirates in their opener. This was continued with a 0–1 loss to Iran and 1–2 to Bahrain. Qatar was eliminated in the group stages with no points and placed 4th in Group C.
Qatar's campaign in qualifying for the 2018 World Cup in Russia was a surprise. Their start in the second round of World Cup qualifying in the AFC was nearly perfect, with seven wins and only one loss. However, their success in the second round didn't follow them to the third round. Qatar finished bottom of their group, ensuring they will play their first World Cup match on home soil in 2022, the first team to do so since Italy in 1934. Qatar's players celebrating the country's first-ever Asian Cup title in the 2019. Qatar continued its poor form in the 2017 Gulf Cup, which was hosted by Kuwait. Qatar opened the tournament with a 4–0 win against minnows Yemen, but that was followed by a 1–2 loss to Iraq and an unconvincing 1–1 draw to Bahrain. Qatar took the third place in Group B with four points and was eliminated in the group stage of the competition, which was considered as an upset of the tournament, especially after winning the 2014 edition. 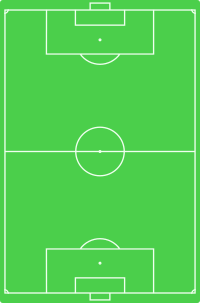 Qatar starting line-up against Japan at the 2019 AFC Asian Cup Final, a match they won 3–1. However, Qatar had an excellent campaign at the 2019 Asian Cup. Their opener saw them defeat Lebanon 2–0. This was followed by a 6–0 thrashing of North Korea and a 2–0 win against three-time champions Saudi Arabia, which sealed the team getting first place in the group. They had a 1–0 win against Iraq in the Round of 16 and a late win against defending runners-up South Korea in the quarterfinals, seeing them through to the semifinals for the first time ever, where they defeated the hosts United Arab Emirates 4–0 to set up a final against 4-time winners Japan. Qatar ended up winning the tournament with a 3–1 win over Japan, marking their first ever major tournament title in their history, and capping off one of the most improbable Asian Cup runs in the tournament's history, especially since they conceded only one goal in all their games. The Arabian Gulf Cup has been played on a bi-annual basis since 1970. The tournament has changed since the first edition from a round-robin basis to a knockout tournament in the latter years. Notably, the 2000 edition was cancelled and the 2003 and 2010 were moved due to congested fixture lists with other tournaments, such as the Asian Cup. Qatar will be the second team from outside the Americas to participate in the Copa América, and will be invited for the first time in 2019. The following are Qatar's results in the last 12 months and upcoming fixtures. Tournament date: 5 January to 1 February 2019. Caps and goals correct as of: 1 February 2019, after the match against Japan. The final squad for the 2019 AFC Asian Cup was announced on 27 December 2018. Ahmed Moein was replaced by Khaled Mohammed on 3 January 2019 due to injury. The following players have been called up for the Qatar squad within the last 12 months. 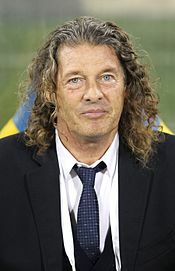 Bruno Metsu, former manager of Qatar. ^ "Al Haydos: It's an honour to captain my country". FIFA.com. 13 November 2016. Retrieved 25 December 2017. ^ "Qatar stadia". qatarvisitor.com. Retrieved 26 December 2014. ^ "Chronological timeline". bbc.com. 25 November 2014. Retrieved 26 December 2014. ^ "History: Supreme Committee for Delivery & Legacy". sc.qa. Retrieved 26 December 2014. ^ "Gulf Cup: History". gulfcup.com. Retrieved 26 December 2014. ^ "Match report (Bahrain v Qatar), 1970". gulfcup.com. Retrieved 26 December 2014. ^ "Final table (1970 Gulf Cup)". gulfcup.com. Retrieved 26 December 2014. ^ "Final table (1972 Gulf Cup)". gulfcup.com. Retrieved 26 December 2014. ^ "Match report (Qatar v UAE), 1974". gulfcup.com. Retrieved 26 December 2014. ^ "Final table (1976 Gulf Cup)". gulfcup.com. Retrieved 26 December 2014. ^ "Team preliminary competition facts: AFC" (PDF). FIFA. Retrieved 26 December 2014. ^ "1980 Asian Nations Cup". rsssf.com. Retrieved 26 December 2014. ^ "Final table (1984 Gulf Cup)". gulfcup.com. Retrieved 26 December 2014. ^ "1988 Asian Nations Cup". rsssf.com. Archived from the original on 12 September 2012. Retrieved 26 December 2014. ^ "Qatar: FIFA/Coca-Cola World Ranking". FIFA. Retrieved 26 December 2014. ^ "Final table (1990 Gulf Cup)". gulfcup.com. Retrieved 26 December 2014. ^ "Final table (1992 Gulf Cup)". gulfcup.com. Retrieved 26 December 2014. ^ "1998 Arab Cup". rsssf.com. Retrieved 26 December 2014. ^ "2000 Asian Cup". rsssf.com. Retrieved 26 December 2014. ^ "Qatar FA sack Jorge Fossati". soccerway.com. 24 September 2008. Retrieved 26 December 2014. ^ "Russia and Qatar awarded 2018 and 2022 FIFA World Cups". FIFA. 2 December 2010. Retrieved 26 December 2014. ^ "Belmadi: Qatar have big ambitions". FIFA. 2 December 2014. Retrieved 26 December 2014. ^ "Qatar lift Gulf Cup". Gulf Daily News. 26 November 2014. Retrieved 27 November 2014. ^ "AFC Asian Cup UAE 2019 Complete Squad Lists" (PDF). Asian Football Confederation. 27 December 2018. ^ "فيليكس سانشيز يضم خالد محمد لقائمة منتخبنا الوطني الأول في كأس آسيا واستبعاد أحمد معين للإصابة – الاتحاد القطري لكرة القدم". QFA (in Arabic). 3 January 2019. Retrieved 5 January 2019. ^ "Asian Cup 2019: Math report, Saudi Arabia v. Qatar". The AFC. Retrieved 18 January 2019. ^ a b c d e f g h i j k l m n o p q r s t u v w x Hassanin Mubarak. "Qatar national team coaches". RSSSF. Retrieved 15 July 2013. ^ "No Macedo touch for Qatar". The Strait Times. 27 November 1984. Retrieved 17 December 2014. ^ Placar Magazine May 31, 1985. Placar Magazine. 31 May 1985. Retrieved 15 July 2014. ^ Placar Magazine April 28, 1986. Placar Magazine. 28 April 1986. Retrieved 15 July 2014. ^ "Dissertation on the Brazilian title Coritiba 1985". globoesporte.globo.com. 8 January 2013. Retrieved 15 July 2014. ^ Placar Magazine Oct 11, 1985. Placar Magazine. 11 October 1985. Retrieved 15 July 2014. ^ a b c d e f g h i "Técnicos brasileiros que atuaram em seleções estrangeiras". RSSSF.com. Retrieved 15 July 2013. ^ "المدرب - محمد دهام (Coach - Mohammed Daham". mundial11.com (in Arabic). Retrieved 6 August 2017. ^ a b "Gulf Cup 20 – Qatar". gulfcup20.org. Retrieved 15 July 2014. ^ "International matches 1993 – Asia". rsssf.com. Retrieved 20 December 2014. ^ a b c d e f g "جمال حاجي مدرباً لقطر و300 الف دولار لبونفرير". daharchives.alhayat.com. 27 September 1999. Retrieved 15 July 2014. ^ a b "35 ألف دولار شهرياً لبونفرير والخليفي يؤكد أن حاجي أفضل". daharchives.alhayat.com. 11 February 1999. Retrieved 15 July 2014. ^ "الاتحاد القطري يوزع مكافآت الفوز على السعودية". daharchives.alhayat.com. 4 October 2010. Retrieved 15 July 2014. ^ "التصفيات الآسيوية الحاسمة لمونديال 2002 لكرة القدم". daharchives.alhayat.com. 21 September 2001. Retrieved 15 July 2014. ^ "Sanchez appointed Qatar coach". Punch Nigeria. 3 July 2017. Retrieved 3 July 2017. ^ Naeim Albakr. "International caps". RSSSF. Retrieved 14 September 2013. ^ a b "Qatar stats". qatarfnt. Retrieved 14 September 2016. This page is based on the Wikipedia article Qatar national football team; it is used under the Creative Commons Attribution-ShareAlike 3.0 Unported License (CC-BY-SA). You may redistribute it, verbatim or modified, providing that you comply with the terms of the CC-BY-SA.